I got back from New York State on Monday. After less than 24 hours at home, it was off to Portland, OR. Luckily we found a flight out of Springfield Capitol Airport. So far all my flights have been out of St. Louis, which adds an hour and a half to every trip which is a pain. Portland is my kind of city. I've only been here a couple days now, but I've been pretty impressed with what I've seen. The area around the truck parts place that we are working on is pretty industrial, pretty easy to guess that. But I guess there's been a bit of a trendy revival in this area, the Northwest part of town. Old buildings that might otherwise just rot have been renovated into apartments and restaurants, which gives everything alot of character. There's all kinds of fun stuff on the Portland Wikipedia page (wikipedia by the way, is really the only web-page that you need). Matt Groening, the creator of the Simpsons, is a Portland native. He named several of the characters from the show after streets in this area. 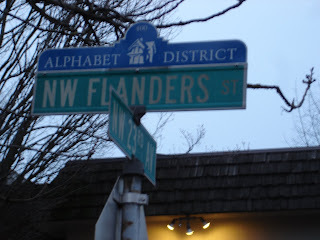 There's a Lovejoy, Quimby, and a Flanders street. I saw a couple of them on a long walk I took last night. The layout of the streets in this area is awesome for someone from out of town. The streets are numbered going one way, then the streets going the other way are in alphabetical order. Pretty smart way to do things I think. I ended up dominating some sushi and sake at a little Japanese place that I found along the way. Portland is like the beer capital of the US, and its the birthplace of the microbrewery movement. 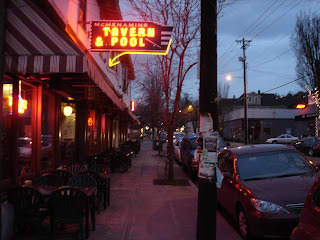 There's a large chain of breweries/pubs called McMenamins t hat buy random old buildings such as a school and a ballroom and turn them into trendy pubs. Pretty cool, I ate at one that dated back to prohibition. I hear that Portland also has several movie theatres that serve beer, so I might have to try to make time to visit one of those. So yeah, all kinds of exciting stuff. I'll be here until Tuesday, so I'm cautiously optimistic about being able to do some fun stuff in my free time. Tomorrow, though, we are doing a day trip to a branch in Grants Pass, OR. That just so happens to be on the opposite end of the state, so I'm in for an early, long drive. I'm hoping the scenery might be worth it, as it wont just be cornfields and barns like it is in Illinois.